Topic: 2019 NAMM YAMAHA - Any important release? Any major release of keyboards arrangers in the "2019 NAMM"? I was expecting a new PSR (s680 or 690 or s990, etc ...). Re: 2019 NAMM YAMAHA - Any important release? I was also expecting a PSR-S675 or 680... But, well, I will keep busy until it arrives with my other keyboards! I was hoping but not expecting a new PSR S 980 ( ?) or something close to it. I am looking for a a PSR S975 with 88 keys, hammer action and the great sounds it delivers.... all for undr $2700 USD. The Casio Px 560 looks interesting but just not up to the sounds and overall ability of the PSR S instruments. Now I have to decide if I am going to upgrade my PSR S900 to the 975 or wait? The only thing Yamaha released keyrelated is 2 stagepiano’s and a keytar.. The CP 88 and 73 are identical, exception the keybed..
Main difference, the engine, cp88 and cp73 have a Nord like structure with 3 parts..
... And the PSR-E360, don’t forget that! Maybe my arrogance, but whats new about that? For me just a new sticker on the same old same..
Well, in defense of my answer, you did not say "completely new key-related releases." Besides, it's my understanding that the keytar is a reworking of a previous product, so is it really "new"? In any case, the PSR-E360 is presumably the same as the PSR-E263 (although that's an assumption based on the number of voices and styles and polyphony, and until we can compare their manuals we won't know for sure), with the important difference being that the PSR-E360 has a velocity-sensitive keyboard as compared to the PSR-E263 which does not. I found out there is not only a new Bosendorfer sample.. There also is a brand new U1 upright piano.. Same goes for the CP80 samples..
And the whole DP cattegory are new samples..
IMHO the E360 is a pure marketing product. In Europe, if you take for instance the Woodbrass music store, they sell the E360 (pre-sale) for € 242, whereas the E363, with its USB slot, bi-directional digital audio interface, ability to control musical software on an iPad or a computer, memory slot to accommodate 10 user styles etc., sells currently for € 185! As compared with the E363, a beginner’s favourite, the E360 is a fraud. Except for its looks, the E363 is vastly inferior to the E363. The only interest that I would see to the E360 would be if it completely replaced the E263, at exactly the same price tag. Come on Yamaha, you can do better than this, esp. with Casio targeting its excellent CT-X 700/800 at beginners! I am wondering whether Yamaha are aware that Casio released the CT-X line last year, or are they just blind...? I’m definitely not trying to promote or justify or defend the PSR-E360, by any means. My only point was that— whether we like it or not, and even if we might like to forget about it— the PSR-E360 was a “keyrelated” release from Yamaha at the Winter NAMM this year. There is much truth in this statement..
And the color of the casing was spot on. I would REALLY LOVE to have such colors on the S models as well! I saw Jeremy's video too - he made some excellent points. By Yamaha model numbering system, the PSR E360 is a downgrade from the E363... it offers less, so why the price increase? I think some of us are getting really disappointed in the Yamaha's current marketing model. With the S975 (a S970 replacement), we saw a few added features and more expansion memory for the same price as the S970. I can't get too worked up about the PSR-E360. I took a quick scan of the E360 page at the Yamaha USA site just to get the gestalt of the product positioning. They're selling to people who care more about furniture than specs -- definitely not "tech heads." Is that so bad? The entry-level market moves 10x or more units than the mid-range. (I don't have the exact USA sales numbers at my fingertips.) If the new color shifts more boxes, good on Yamaha. Personally, I don't like the styling myself. Reminds me of a faux woodgrain dashboard in a 1970's Ford. Then again, the target market -- which may not even really be the USA! -- might love it. Michael mentioned the Yamaha SHS-500 keytar. The SHS-500 platform is essentially the same as the Yamaha Vocaloid VKB-100 keytar. The VKB-100 had 13 or so musical instrument sounds in addition to the Miku, etc. Vocaloid stuff. The musical instrument sounds are (roughly) PSR-E quality. Yamaha has not really been able to make much money on Vocaloid outside of Japan. So, it makes sense to re-purpose the VKB-100 and produce an inexpensive, fun keytar for the world market. ... Personally, I don't like the styling myself. Reminds me of a faux woodgrain dashboard in a 1970's Ford. I have nothing against Yamaha marketing the PSR E360 as a piece of furniture on which you can play music. What I find unpalatable is that in France it is advertised for 249 € whereas the much more sophisticated PSR E363 now goes for 185 €. And if parents buy the E360 for a kid, they will also find it unpalatable when they will realise that they can’t even connect the keyboard to a computer nor to an iPad. This might be acceptable for the E263, which hasn’t touch-sensitive keys, but not for the E360. IMHO, if parents are enough music-oriented to care about touch-sensitive keys, they are probably geeky enough to care about digital connectivity. And there are contenders: here in France, the Casio CTK-3500, which currently sells for about 140 €, has touch-sensitivity, a pitch-bend wheel, an USB socket to connect it to an iPad, android device or computer, as well as on-bass and full-range chord recognition modes (I don’t count the Dance Music mode because it is more a gimmick than something else and I would rather have had an onboard arpeggiator). Actually, I am seriously considering buying the CTK-3500 myself as a second keyboard for travelling, vacations and gigging with friends (at this point, I am strongly hesitating between the CTK-3500, the CT-X800 which has the arpeggiator and the hype AiX sound chip, and the PSR E363 with its bidirectional digital audio interface). Basically, 88 weighted keys, 700 tones, 200 rhythms, 3 track sequencer, but then where it really gets interesting is 192 note maximum polyphony, string resonance and damper/key-action sounds for the piano sounds, as well as two live-control knobs. Also has an arpeggiator and 96 registrations, though I don't know what parameters can be stored to the registrations. Basically, it seems to have a lot of the sound capability of a PSR-E463, but with the advanced piano nuances found on much more expensive keyboards. Still a bit out of my price range, but would be interesting to see when it becomes available locally. There is also the new Casio CDP-S350, which I think has comparable numbers to the PX-S3000 as far as its tones, etc., although I think it has much lower polyphony, possibly a lower-quality keybed (but still good I hope), and which costs a good bit less. Actually the CDP-S350 has the same specs sound and features use as the CT-X800. By the way after having tried both the CT-X3000 (the UI is a nightmare) and the PSR E463 (mediocre keybed), I am seriously considering the CT-X800 as a replacement to my long gone E433. I have been toying for months with the idea of getting a PSR-S670, a PSR-E463 or a Casio CT-X5000 as a light-enough portable keyboard, as the Genos nor the DGX660 are good for that. But can't decide! I was considering the CDP-S350 as an 88-note keyboard, although I really don’t have any room for another keyboard right now, especially one with 88 keys. And I definitely don’t need to be spending any more money on another keyboard right now! Beware that the CT-X5000 is portable but I found it bulkier than the E463. I have the same issue as you have: my DGX650 is not portable (you can move it in another room of the house at the most) and I need a light, fun portable keyboard but I can’t decide which. I am strongly tempted to try the CT-X800. The only hesitation I have is about the impossibility to adjust the relative volumes of the Upper1 (aka Main), Upper2 (aka Dual) and Lower (aka Split) voices. If you want to toy around with a Casio keyboard, try out the CT-X800 in a music shop. It has all the bells and whistles of the CDP-S360 (same data sheet, same specs excepted for the 88 keys of the CDP), it is lighter, more portable, and has only the standard 61 keys. And it is also much cheaper. Due to the high number of competitive products ( low prices ), I wonder if Yamaha will continue the production of this type of keyboards in the near future. IMHO Yamaha's market share might be low, right or wrong ? Or maybe strong in Asia ? This cattegorie of keyboards is huge in Asia, where typically only under €1000 sell well to extremely well.. This is just the USA. That's a lot of entry level keyboards. I don't think Yamaha can afford to ignore the entry market. Very interesting. So apparently entry-level keyboards sell many more units, but higher-end keyboards bring much more money in the house. So I agree, Yamaha can’t afford to ignore the entry market, but this is not a reason to think people are dumb and trying to sell them a product which is more expensive than the previous product and which has less functionalities. Well apparently dealers are beginning to realise that the E360 is highly overpriced. For instance at Sam Ash, the E360 is advertised at $ 189,99, and the E363 at € 179,99. The E363 still makes a better deal for the time being, though. I wish the $199 breakpoint was a little higher since models like the E463 would fall into the "above $199" category. That change would yield a more useful (better?) "entry" versus "mid plus upper" measure. Of course, I don't have much sway with NAMM. Given that "keyboard synthesizers" move only 81,000 units, I'd wager that most of the "above $199" keyboards are actually entry-level. Good observation about average selling price (ASP). Don't forget that 'keyboard' is a catch all term. There's nothing there to confirm that those numbers are all arranger keyboards. Hammonds, Nords, etc, not to mention classical keyboards don't fit into any other category, for example. The table is an excerpt from a much larger table and report. NAMM sells the report and it is not freely distributed. Thus, a short quote to avoid copyright issues. The report also breaks out stats by country -- where possible -- but that reporting is inconsistent WRT categories and such. There is a separate category for the piano and organ market (acoustic grand pianos, acoustic vertical pianos, electronic player pianos, digital pianos, and organs). To all the engineers here, it's only marketing. 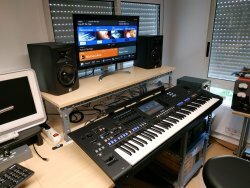 There is the upcoming international Musikinstrumentmesse in Frankfurt, Germany, in the beginning of April, where Yamaha usually presents their new entry-level and middle-level arranger keyboards. I hope there will be a new psr-EW4XX or psr-EW5XX 76 keys instrument. The PSR-EW410 was just released in 2018, so any replacement model (presumably named the PSR-EW420) is not expected until 2020 at the soonest. Besides the somewhat bizarre E360 which was launched at NAMM, do you think there is any hope of a E273/373 being launched at Frankfort? Here in Europe, Woodbrass has stopped marketing the E363 and I am wondering whether they are just out of stock or whether they will completely replace it by the E360, which would be a great loss for people starting playing the keyboard, since the E363 is such a great beginner keyboard with so many more functionalities than the E360, such as the ability to load up to 10 external styles, the integrated digital audio interface, and the USB connectivity to communicate with a computer or an iPad. Don't forget a lot of these low end keyboards are used in schools for education purposes and this will account for quite a few sales. Indeed. This is why I find it a pity that the new PSR E360, which currently is advertised for 50 euros more than the E363, does not have the USB socket of the latter, neither its integrated digital audio interface, nor its MIDI recording facility. Not to mention the fact that the E363 can accommodate 10 external style files. For education purposes, it would have been cool to be able to connect the E360 to an iPad, especially given the great musical apps made freely available by Yamaha, such as ChordTracker, Audio Recorder etc. I seriously hope the E363 won’t be discontinued since it is such a great keyboard for beginners and children. I suppose it's possible that the PSR-E360 was meant to be an additional model in the PSR-E line, rather than a replacement model per se-- for instance, something to challenge Roland's GO:KEYS? If that should prove to be the case, then we may eventually see a PSR-E373 and PSR-E273. But only Yamaha knows how the PSR-E360 was intended to fit into the PSR-E line, and what's planned for the PSR-E line in the future. There are a number of new developments in MIDI which are being planned and worked on by the MMA (MIDI Manufacturers Association), of which Yamaha is a member. Who can say how long the current lines of keyboards will continue, or if they'll be replaced by brand new lines with completely different names? If that should prove to be the case, then we may eventually see a PSR-E373 and PSR-E273. Hear, hear! I get tired of "reading the tea leaves" in Yamaha's cup. Stylistically, Yamaha would do better to adopt the aesthetics of the Roland "fashion piano" FP series. Now, there is style! I'm sure that that Keytar is a joke , more like an air guitar!! Haven't read the posts here. In another post Michael (SeaGtGruff) is having examples between the BIG differences between MSRP prices and the real prices the keyboards are finally sold at stores. So Jeremy maybe is totally wrong in this video comparing the 2 keyboards. I don't see the E-360(the ex 263)availiable in my country yet to check the real prices between them. Anyway, it is a free market.